Deltas are economic and environmental hotspots and often support high population densities, estimated at over 500 million people globally, with particular concentrations in South, South-East and East Asia and Africa. The four deltas, which are the focus of the DECCMA project, are home to almost 200 million people, many of whom are farmers who provide food for a large proportion of the population. 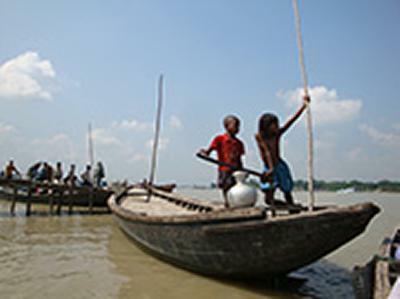 The just under five-year DECCMA (DEltas, vulnerability and Climate Change: Migration and Adaptation) project will examine how people are adapting to the physical effects of climate change, such as sea level rise, alongside socio-economic pressures, including land degradation and population pressure, in delta regions. It aims to develop methods to predict how these four deltas may evolve over the next 50 to 100 years and provide Governments with the knowledge and tools to ensure future policy can maximise planning services and programmes to the benefit of the region’s population. There will be a particular focus on the potential benefits of planned migration versus other adaptation choices such as dike construction. Deltas, many of which are found in Asia and Africa, were identified by the Intergovernmental Panel on Climate Change (IPCC) as being especially vulnerable hotspots to climate change and sea-level rise with poor understanding of the possible adaptation responses. The project considers two large deltas – Nile in Egypt and the Ganges-Brahmaputra in Bangladesh and India, plus two smaller deltas – the Mahanadi in India and the Volta in Ghana. The $13.5m Canadian dollar DECCMA (DEltas, vulnerability and Climate Change: Migration and Adaptation) project is funded by Canada’s International Development Research Centre (IDRC) and the UK’s Department for International Development (DFID). The interdisciplinary project is led by Professor Robert Nicholls from Engineering and the Environment, with Dr Craig Hutton and Dr Emma Tompkins from Geography and Environment. Other researchers from Southampton who will be involved in this project are: Dr Derek Clarke, Professor Steve Darby, Professor John Dearing, Mr Chris Hill, Dr Fifi Johnson and Professor Sabu Padmadas. Southampton researchers will also be engaging with experts from the Basque Centre for Climate Change, the Universities of Dundee and Exeter, the Met Office Hadley Centre, Plymouth Marine Labs, and the UN Food and Agriculture Organisation (FAO), Rome. The DECCMA project is one of three current large research projects, involving the University of Southampton, looking into the effects of climate change on vulnerable delta regions around the world. The others are the ESPA Delta project, which is assessing the changing ecosystem services deltas provide and the Belmont Forum project ‘Catalyzing action towards sustainability of deltaic systems with an integrated modelling framework for risk assessment’, project. Nile delta, Egypt – National Authority for Remoting Sensing and Space Sciences. Ganges-Brahmaputra delta, Bangladesh and India - Bangladesh University of Engineering and Technology. Mahanadi delta, India – Jadavpur University.